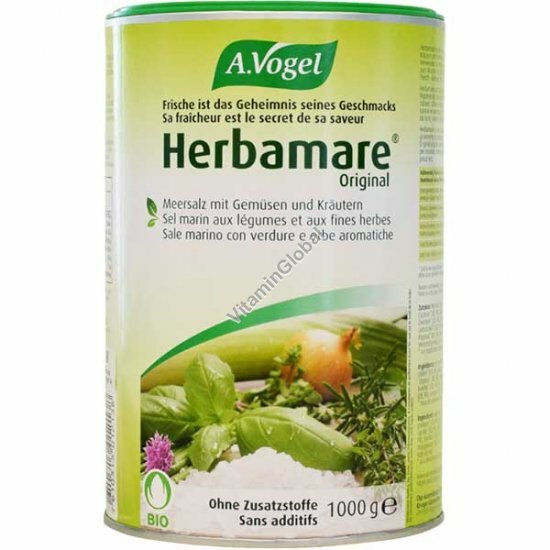 Herbamare is made according to the original recipe of the world famous Swiss naturopath Alfred Vogel and is prepared with fresh, organically grown herbs. The fresh herbs are combined with natural sea salt and allowed to ‘steep' for up to one year before the moisture is removed by a special vacuum process at low temperature. This Steeping process integrates the full herb and vegetable flavour into the salt crystal. Use Herbamare on salads, vegetables, beans and rice, pasta, meats or pizza for a deliciously seasoned dish. Keep a container on your table as an alternative to plain table salt and in your condiment cupboard for easy cooking. Ingredients: Sea salt, celery leaves*, leek*, cress*(water and garden), onion*, chive*, parsley*, lovage*, garlic*, basil*, marjoram*, rosemary*, thyme*, kelp (with trace iodine).